Between July 28th and 30th, the delegation of International Department, Central Committee of CPC led by Vice Minister Wang Yajun and the Chinese social organization joint delegation led by Secretary General Zhu Rui of China NGO Network for International Exchanges (CNIE) made a joint visit to Nepal. During the meetings with Mr. Khadga Prasad Sharma Oli, Prime Minister of Nepal, Tham Maya Thapa, Minister of Social Welfare in Nepal, and Ms. Yu Hong, Chinese Ambassador to Nepal, the delegation exchanged views with the above parties on the international development assistance work carried out by Chinese NGOs in Nepal. During the three-day trip, the delegation also attended the school bag donation ceremony at Mahendra Adasha Witishham (hereinafter referred to as MAV) school and visited CFPA’s Nepal Office. Wang Xingzui, CFPA’s Vice President hosted the reception. As many as 26 Chinese NGOs are set to get permits for operation in Nepal within a couple of months with the Social Welfare Council and CNIE signing an agreement on Sunday, aiming at promoting development and cooperation between social organizations from the two countries on Sunday in Kathmandu. Representatives from China and Nepal exchanged views on three major areas of people's livelihood, namely medical care, education and poverty alleviation, and discussed the possibility of cooperation. 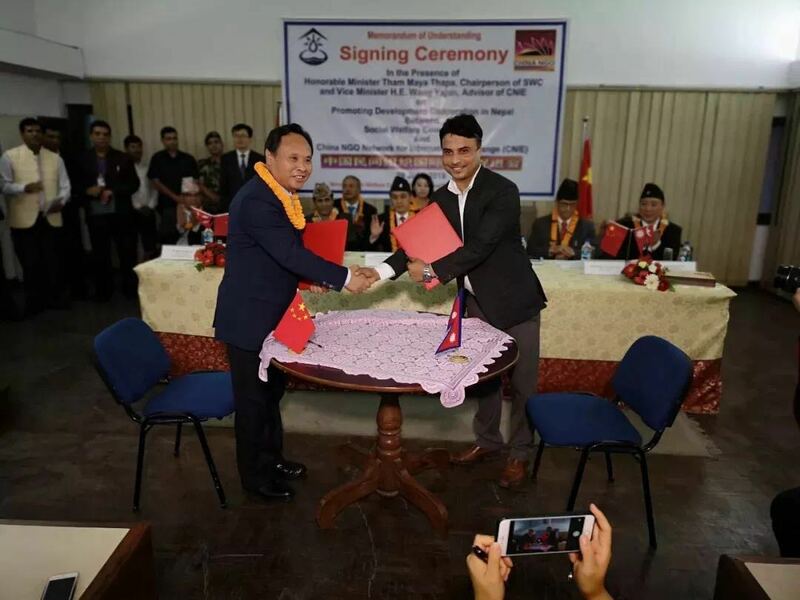 CFPA was among the 11 organizations that signed agreements or MOUs with their Nepalese counterparts on Sunday. On behalf of CFPA, Vice President Wang Xingzui signed the Memorandum of Three-Year Plan for Nepal with Nepal Golden Sun Charity Association, pledging to donate about 6 million RMB from 2018 to 2020 in support of the WASH project, youth training program and international school bag project for further improvement of people’s living conditions in poor areas of Nepal. As part of the endeavor to support Nepal's education, China Foundation for Poverty Alleviation distributed school bags, stationery items and sports accessories to the students of Mahendra Adarsha Vidyashram school in Kathmandu. Wang Yajun, Vice Minister of International Liaison Department, Pampha Bhusal, Nepali former minister and other officials, attended the donation ceremony. Ms. Pampha Bhusal spoke highly of the Chinese assistance that has enabled hundreds of Nepali students to get quality education, "The Chinese support is very instrumental for the bright future of our students. It will not just boost the quality education of the country, but also strengthen the people-to-people ties between the two countries." Established in 1958, MAV is the oldest school in the area that has been providing education to around 600 students up to higher secondary level. CFPA is constructing a two-storey building within the school compound after its buildings were severely damaged by the strong earthquake of 2015. The delegation also visited the Nepal Office of CFPA to gain an in-depth understanding of our work. Vice President Wang Xingzui briefed Vice Minister Wang Yajun on CFPA’s internationalization and the results of our three-year work in Nepal. Director of Nepal Office, Zou Zhiqiang, accompanied the reception. Wang and Zhu reviewed the archives of the health screening project and the photos of various stages of earthquake relief and reconstruction after touring the office. 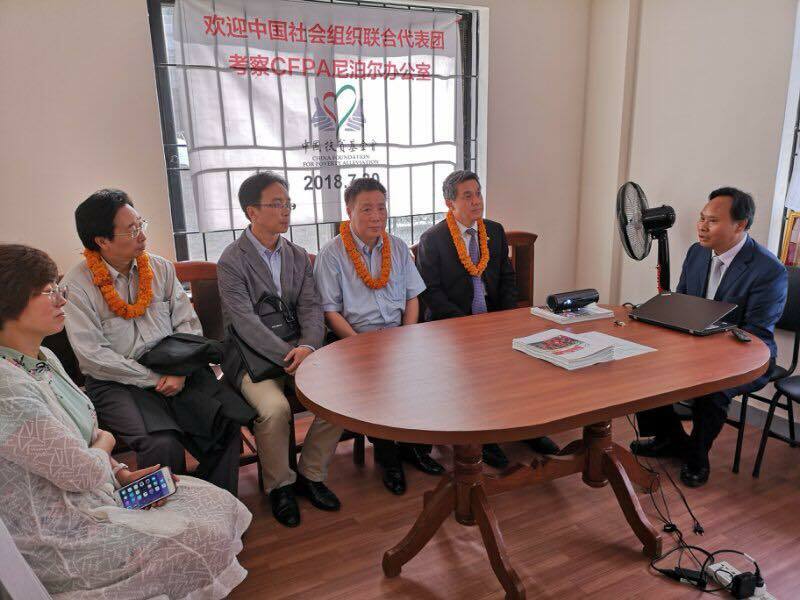 They praised CFPA for going deep into local communities to carry out assistance work after the 2015 earthquake, understanding what Nepalese people think and doing what Nepalese people need, and that CFPA is a pioneering explorer among Chinese NGOS in Nepal. Vice Minister Wang Yajun encouraged CFPA to continue our efforts and make greater achievements. After learning that CFPA’s Great Walker launched the first international fundraising project this year, which is raising love packages for Nepalese primary school students, Wang left a signature on the Great Walker T-shirt to show his support. The friendship between China and Nepal has a long history. The delegation’s visit opened a new door for civil cooperation between the two nations. CFPA is willing to work with all parties to build a bridge between China and Nepal and make our own contributions to the development of Nepal.